Take a bud from the branch of a honey crisp — or any other apple variety — and then attach, or graft, that bud onto an apple rootstock. To demonstrate, Todd Holleran from the USDA made a small incision in a rootstock. He then removed a bud from an apple tree branch. The bud was placed on the incision in the rootstock and a biodegradable bandage of sorts was wrapped around it. Take a bud from the branch of a honey crisp — or any other apple variety — and then attach, or graft, that bud onto an apple rootstock. To demonstrate, Holleran made a small incision in a rootstock. He then removed a bud from an apple tree branch. The bud was placed on the incision in the rootstock and a biodegradable bandage of sorts is wrapped around it. 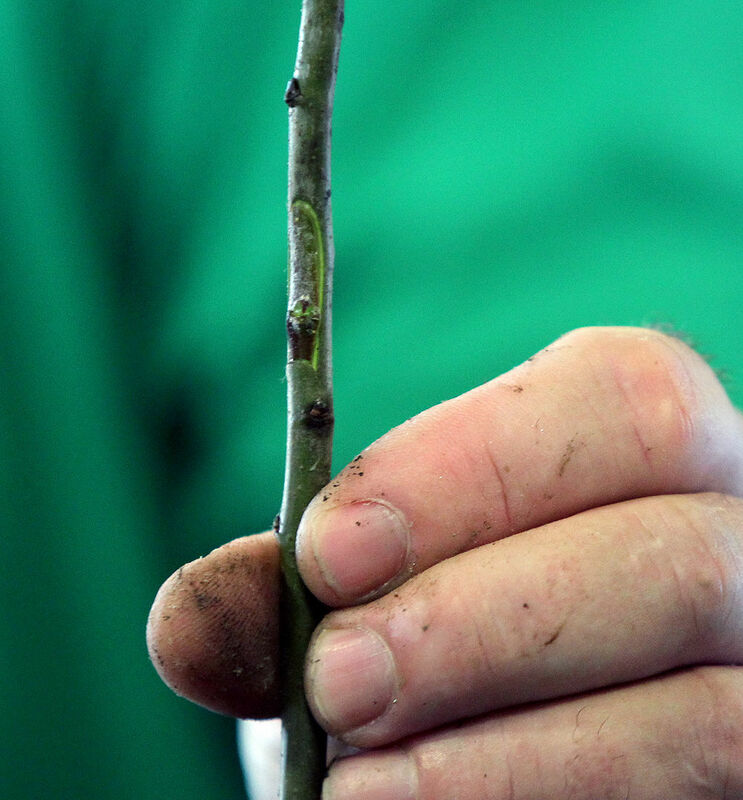 Todd Holleran, an agricultural science research technician with the United States Department of Agriculture’s Plant Genetic Resources Unit, gave a demonstration at EFD on grafting, a process by which the bud from one apple tree is attached to an apple tree rootstock to form a new tree. SENECA FALLS — A horticultural practice that dates back beyond biblical times plays a key role in the ever-increasing varieties of tree fruit — including apples — that are being developed around the nation, and of course, at Geneva’s ag station. It’s grafting, a process by which the bud from one apple tree is attached to an apple tree rootstock to form a new tree. “It is one of the oldest (techniques) in the world,” said Todd Holleran, an agricultural science research technician with the U.S. Department of Agriculture’s Plant Genetic Resources Unit, which is on the campus of Cornell AgriTech, the new name for the Geneva experiment station. Opening day of the Empire Farm Days expo at the Rodman Lott & SonFarms in Seneca Falls saw crowds size less than normal due to rain showers that were expected and did fall there Tuesday. Matt Boucher a graduate student at Cornell Ag Tech in Geneva holds a walking stick insect. Opening day of the Empire Farm Days expo at the Rodman Lott & SonFarms in Seneca Falls saw crowds size less than normal due to rain showers that were expected and did fall there Tuesday. People test out some of the recreation items at the water safety demonstration pond. Kaleigh Fazekas (left) and Lynette Clark of Canasta set up a merchandise display in preparation for the opening of Empire Farm Days at the Rodman Lott & Son Farm in Seneca Falls. The event is one of the largest attractions in the area during the summer drawing thousands of people. Matt Burns of Lift Tech JCB cleans up the treads of some equipment Monday in preparation for the opening of Empire Farm Days at the Rodman Lott & Son Farm in Seneca Falls. The event is one of the largest attractions in the area during the summer drawing thousands of people. Eric Law power washes some Massey Ferguson farm equipment in preparation for the opening of Empire Farm Days at the Rodman Lott & Son Farm in Seneca Falls. The event is one of the largest attractions in the area during the summer drawing thousands of people. A truck is filled with wood chips to be spread around some of the display sites in preparation for the opening of Empire Farm Days at the Rodman Lott & Son Farm in Seneca Falls. The event is one of the largest attractions in the area during the summer drawing thousands of people. Empire Farm Days is in full swing at the Rodman Lott and Son Farms, 2973 Route 414 in Seneca Falls. Show hours are 9 a.m. to 5 p.m. Tuesday (Aug. 7) and Wednesday (Aug. 8), and 9 a.m. to 4 p.m. on Thursday (Aug. 10). Directions and programming details and schedules are posted at www.empirefarmdays.com. He and other USDA representatives are at Empire Farm Days in Seneca Falls this week demonstrating the technique on both apples and grapes. Without getting into all the science, Holleran said, you can’t grow a honey crisp apple tree from seed. Instead, you must take a bud from the branch of a honey crisp — or any other apple variety — and then attach, or graft, that bud onto an apple rootstock. To demonstrate, he made a small incision in a rootstock. He then removed a bud from an apple tree branch. The bud was placed on the incision in the rootstock and a biodegradable bandage of sorts is wrapped around it. Once the graft “healing” process is complete, a new tree should be on the way. Holleran said you’re not restricted to a single fruit variety in grafting. He has developed trees with many apple varieties just for fun. The trend in apple trees is dwarf varieties that don’t grow much taller than 6 feet, said Holleran, explaining they produce lots of apples but don’t take much space and are a whole lot safer to pick than a typical tree. They also don’t require as many pesticides. The dwarfing trait is in the rootstock, he said. 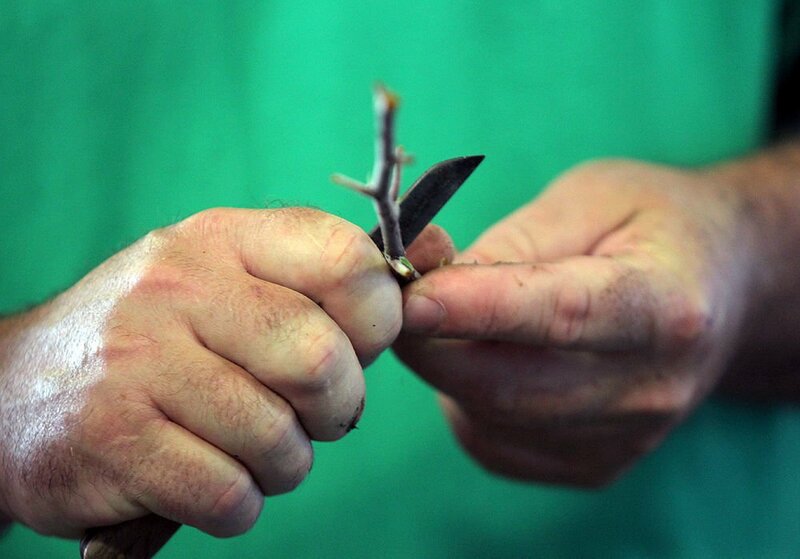 While Holleran and others at the USDA’s Geneva location do grafting as part of their research, his main focus is on the rootstock. It’s there that he and his fellow workers at USDA have developed varieties designed to be resistant to any number of diseases that could kill the tree. The program was at one time part of Cornell’s experiment station but has been under the USDA for several years. Holleran said the two organizations work hand-in-hand on the Cornell campus, noting the College of Agricultural and Life Sciences supplies land, office space and lab space for USDA. USDA is the dominant developer of the apple rootstock market, with 60 percent of the varieties developed in Geneva, said Holleran. It’s exciting times for those involved in the apple industry, he added, explaining the many new varieties being developed by Susan Brown and others at Cornell AgriTech. That includes development of apples designed specifically for the burgeoning hard-cider business that is taking off here, due in part to the large number of apple growers in the region. WHEN: Continues today, 9 a.m.-5 p.m., Thursday, 9 a.m.-4 p.m. DETAILS: Parking lots on the north and south ends of the show. Parking is $10 per car.